As Ron Pearson has written in the Introduction to his book, "The American Patented Brace, 1829 to 1924," that the idea of a brace to bore holes is a relatively new one. The earliest depictions going back only to the 13th or 14th Century (planes and saws, for example, have been around a lot longer). The idea of manufactured iron braces, produced to sell rather than for personal use, is certainly yet a much later one that may not have predated the idea of brace patents by very much time. Accordingly, in this country at least, the earliest iron braces were produced by local blacksmiths, and were used by those smiths or their friends and local customers. Surely such braces were made as early as in the 1600s in New England, and achieved some level of sophistication in the 1700s and early 1800s. These fairly crude looking products of the forge and anvil have an interest and charm of their own. Very seldom signed or dated, each presents different solutions to the problems of (a) holding a replaceable bit; (b) providing a bow with sufficient torque to do the boring job for which it was intended, and (c) providing handle(s) that remained stationary while the rest of the tool turned. That these problems were so vexing is shown by the hundreds of later brace patents that continued to address them throughout the history of the U.S. Patent office. Here are three examples of blacksmith made braces from my collection. The simplest, is a very heavy frame, wrought out of iron stock that is about an inch in diameter. Heavy and crude looking at first glance, the brace is fairly elegantly made. The bow (which has a sweep of 12") is quite symmetrical with a smoothly formed curve. The edges of the square stock at the top and bottom have hammered chamfers. The upper end of the brace (to the left in the picture) has lost its top handle. 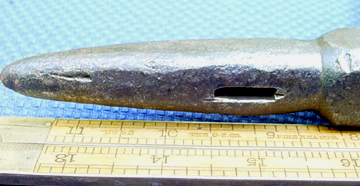 The handle was affixed to a pointed end, which is pierced by a slot about 1/2" from its bottom. There are signs of wear at the base of the point, and it can be surmised that a rotating wooden handle was once mounted here. If I had to guess, I think the slot once held an iron toggle or key that fitted into an interior race in the handle (perhaps laminated), that allowed the handle to rotate, while holding it onto the rest of the brace. 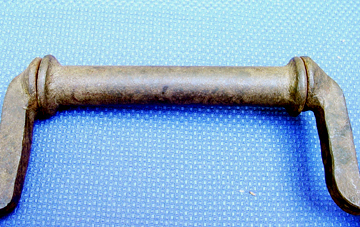 The "chuck" on this is a simple square hole that tapers internally to fit the typical "tang" found at the top of bits from at least early in the Eighteenth Century. The bit is secured only by friction. The appearance of this chuck causes me to guess that it is not as old as the other braces on this page. The fitted shape of the tang receptacle, and the absence of a screw lock or other fixing device suggests an origin of perhaps the first half of the Nineteenth Century. The arrangement for the attachment of a top handle is unique in my brief experience. 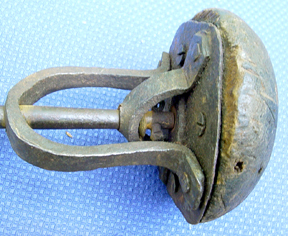 The next blacksmith made brace is of a type known as a "cage head" brace owing to the design of the top handle. These primitive forged braces feature a top handle that is supported by straps of wrought iron , pierced at their centers that are bent out and up to support a platform above the top of the brace shaft. The straps give the appearance of a "bird cage." The platform rests on the top of the shaft, with the supporting straps free to rotate as the shaft is turned. This brace is about 15" long overall, and has a sweep of about 10". It is much lighter and more delicately wrought than the brace above. This brace has a bird cage handle, but is a bit different from others of its genre. Instead of nearly identical straps, this one has two of unequal length. So there are two long elements of the "cage" and two smaller and inner elements. These are riveted to a flat platform at the top. 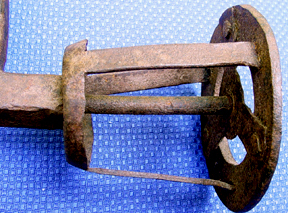 The frame rests against the bottom of this platform and is prevented from pulling through the pierced straps below by a forged pin driven through the frame. A nice dished out washer between the pin and the upper strap completes the mechanism. The handle is further enhanced by a wood top screwed to the platform with three slotted wood screws. I'd like to think that this is a later addition to the brace. The workmanship on this brace is more crude than that of the first brace. There is little chamfering of the edges, and the symmetry of the bow is not as good. The chuck again consists of a friction fit hole for the tang of a bit, but this hole is not nearly as recent seeming.  It is elongate, rather than square, and the internal tapering is less obvious. Except for the wooden top handle I consider this to be the oldest of the early braces shown here. It may date back to the late 1700s. But this brace has other nifty features as well. This is a fairly typical cage head brace, with the top plate supports bent upwards from a basal plate. The supports pass through the perimeter of the top plate and are peened over. The central axis of the "cage" is a rod that is fitted into the top of the main shaft of the brace, and itself pierces an inner top plate that is, in turn, riveted to the perimeter plate. The handle freely rotates around this central rod. Another interesting feature is that this brace has a rotating wrist handle as well as a top handle. Without X-ray vision I can't determine if the rotating flanged sleeve that forms the wrist handle was positioned before the bow was bent or not. But it freely turns and is permanently captive between forged flanges on the main shaft. Finally, this brace is noteworthy for having a chuck that features a thumb screw for fixing the bit tang firmly in the chuck.. The tang receptacle is especially large and oblong, and a standard bit would have quite a loose fit. The maker chose to craft a "thumb screw that has an almost artistic scroll to it, and certainly helps set this brace off as "special. I don't consider this brace to be especially old--probably 19th Century--but it certainly was put together by a craftsman.